Braids, braids and MORE braids, it's important to stand out with original designs in photography and behind the chair. Robert Brown, Goldwell® North American Artistic Team and owner of hairobert was inspired by the military and equestrian themes which translated to chess playing pieces. 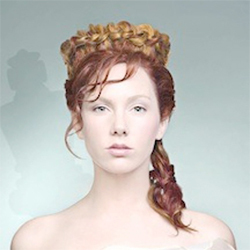 His White Queen is pallid and icy with muted coppers and burnished golds that put a brand new spin on braid placement. "The look is timeless and easily suited for bridal or other formal styling. It can be ethereal with fuller texture as seen or sleek and chic with less texture and more shine," says Brown. Naturally wavy hair was hand-dried and diffused to encourage natural movement. A cocktail of Goldwell® StyleSign® Top Whip® Strengthening Volume Mousse mixed with some blasts of Goldwell® Sleek Perfection® Thermal Spray was applied for softness and texture. Created a French Braid along the part, feeding only from the hair INSIDE the circle. After completing the circle, use a crochet hook to feed the tail of the braid through the start of the braid to mix and blend the crown disguising the start/stop points. Using a bit of Goldwell® StyleSign® Magic Finish® Brilliance Hairspray, use fingers to "open" up the braided crown to the appropriate size and reveal more of the looping effect. Remaining hair was swept back and to the side and ribboned loosely into a 4-strand braid. Pushing the braid up with more Goldwell® StyleSign® Magic Finish® Brilliance Hairspray and soft finger-teasing the ends kept it in place without a tie. Fringe along the face was kept soft and wispy using a large curling wand and minimal hairspray. Natural level 6 w/ highlighted mids/ends. "Spring and summer are the perfect seasons to teach guests how to braid. It takes minutes to demonstrate and clients will be thrilled to have new ways to wear their hair up during the warmer weather," adds Patrick McIvor, Artistic & TechniCulture Director for Goldwell and KMS California and social media mentor. Check out his Pinterest board for inspiration.